I was at Turner Field in Atlanta Friday to watch the St. Louis Cardinals defeat the Atlanta Braves 6-3 in the first-ever Wild Card Play-in Game as part of the newly designed MLB Postseason. The Braves played a terrible ballgame. They committed three errors, each leading to Cardinal runs. St. Louis managed only six hits, but scored six runs – four of them unearned. Atlanta, meanwhile, racked up 12 hits, but managed just three runs, leaving 10, 12, 18, 21 runners on base, depending on where you look (seriously, is it that difficult?). The starting lineups before the game, as seen from my seats in the upper deck. But none of that merits a blog post. Then, “the call” was made by left field umpire Sam Holbrook in the bottom of the eighth inning – the common sense-defying, if not rule-defying application of the infield fly rule to a ball landing in the outfield some 225 feet from home plate. How Holbrook could reason that St. Louis shortstop Pete Kozma was exercising “ordinary effort,” or was “in position” to catch a ball he couldn’t see, or, to the casual observer, was anywhere near the infield, is beyond me. How Holbrook could think that the Atlanta baserunners were in any danger of being deceived into a double play and would be aided by his raising of an index finger less than a second before the ball hit the grass is again unfathomable. How Holbrook could feel inanimate being relegated to calling fair or foul balls down a chalk line in the outfield; how he would desire to do something, even if it was out of his jurisdiction… that makes a little more sense. But none of that merits a blog post, either. Well before last night, I had sided with Jones. You don’t follow a 162-game regular season with a best-of-one playoff round. More than any other sport, the series is essential to baseball. Even a bad team can have one dominant pitcher capable of winning one game. Winning the Postseason rounds that follow require more complete teams than a one-game play-in can adequately determine. But it’s great for ratings. And attendance. I don’t know if I would have made the drive to Atlanta for a Divisional Series contest. Knowing that I would see a definitive outcome at the end of that one game got me to the ballpark. Wild Card Play-in: Bad for baseball, but I loved it in person. The claim of hypocrisy is self-evident and duly noted. But again, though my word count is getting there, none of this inspired me to write. I checked something off the bucket list last night. I attended a Postseason baseball game. It was a fantastic experience. Braves fans, notorious for leaving empty seats, filled Turner Field to capacity, its billionaire namesake one of the 52,631 in attendance. The crowd was electric. The noise in the 1st inning was louder than anything I have ever heard in a 9th inning. We stood virtually the entire game, like we were in the student section on an SEC football Saturday. We were there for the Postseason. We were there for the Braves. 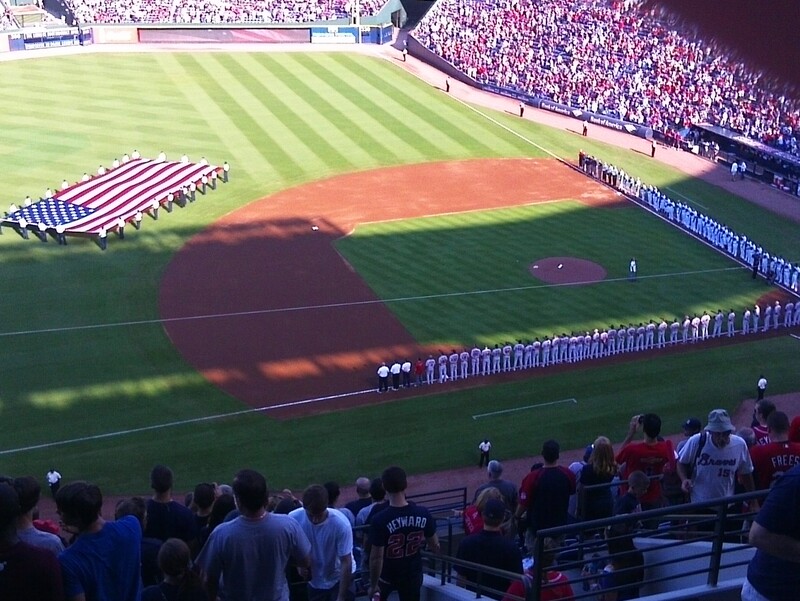 We were there for Chipper, lest it be his final game. Six men in black shirts huddled in the middle of the diamond, standing alone as chaos reigned. They were the umpires, the people in charge of maintaining order at Turner Field, but any semblance of order had long been lost. Discarded water bottles, half-empty cups and partially drunk beer cans came hurtling out of the stands, as a serenade of boos and obscenities rose to a crescendo. The players retreated to their dugouts for shelter. Only the grounds-crew remained, attempting frantically to clean up a mess that had already left a stain. I pulled out my phone to Tweet the first of many messages over the next 19 minutes – the time it took to finally stop fans from firing debris onto the field long enough to resume play. The crowd was ravenous. Loud cheers erupted whenever a bottle or can flew near an umpire. When they ran out of stuff to throw, fans in the left field seats appeared to raid a concession area on the concourse, as condiment bottles added to the mess the grounds crew was trying to clean. I shot videos of the scene, but I couldn’t show them to you with sound. Angry masters of language invented new ways to use obscenities in a sentence, while the less experienced among the enraged joined in what Al Michaels recently called the “manure chant.” Here’s how it looked from my grainy cell phone camera (read as: I really wanted visuals here without violating copyright. Go find some good images on the links.). It got me thinking. I was there, caught up in the electricity of the moment. I screamed until I had no voice. My ears rang well into the night. All from a baseball game. The sport of quiet observation. When the call was made, I was angry. Not enough to hurl my water bottle toward the field (A- My seats were so high up, it never would have made it; B- I was not experiencing the end of my Postseason bucket list baseball game in a holding cell), but enough to find immense gratification in the fans who did. I know exactly how this happened. A few sections lower, a few $7 beers, and maybe I would have let one fly (once again, saved by my own frugality). So this morning, I began writing, in hopes of finding where my conscience stands on the whole idea of stopping play as a form of protest. And as we near the end, I cannot support it. Even in that moment. I understand how it happened, and there’s no way this game would have been as memorable to me without it. But it wasn’t just a harmless protest. Because fans were aiming at the umpires, and they were aiming at the Cardinals players (as Matt Carpenter retook the field for warmup tosses, he appeared to get hit with something near first base before retreating to the center of the field). You would think after all the tomahawk chopping, arms would be too tired to throw beer bottles. Some would argue that this is irrelevant, since glass bottles were prohibited inside the stadium. But who’s to say what fans might have with them that, in the fervor, might become a projectile? St. Louis has been there before. In 1999, Philadelphia Phillies fans threw D-batteries at then-Cardinals outfielder J.D. Drew because of a contract dispute two years prior (see what I mean about Philly fans?). Players and umpires were targeted, fans in seats near the field were hit, and that is unacceptable. I fail to conceive a situation where debris is thrown onto the field in which there doesn’t come the risk of injury, and that makes it a no-go, no matter how satisfying it may seem. It also managed to dampen history at the end of the game. In the bottom of the 9th inning, Chipper Jones stepped up for what would be the final at-bat of his career. Sensing what was coming, Jones lifted his helmet to the fans one final time before entering the batter’s box. He hit a broken bat groundball to second base. The off-balance throw to first was wild and Jones was called safe, never mind that virtually everyone in the stadium could tell he was out. (Hey, that call might have kept Turner Field from being burned to the ground that night.) At least one fan down the first-base line knew Jones was out… because he threw one more bottle right at first base umpire Mike Winters, who agitatedly kicked it aside. Jones would make it to third base and, ironically enough, would be stranded right there. The final out was made, the Braves season over, and more junk was thrown onto the field. It set up one of the saddest dichotomies I’ve seen in sport, though it largely went unnoticed. Outside the third-base dugout, the St. Louis players fled the field and one last volley of projectiles, remaining close to one another as Braves fans, now long removed from the incitement of their anger, continued to embrace its effects. Meanwhile, on the first-base side, Jones, the future hall of famer, the hero that drew the sellout crowd, quickly ran from it, retreating to his home clubhouse. There would be no final curtain call, no matter how much the fans pleaded. 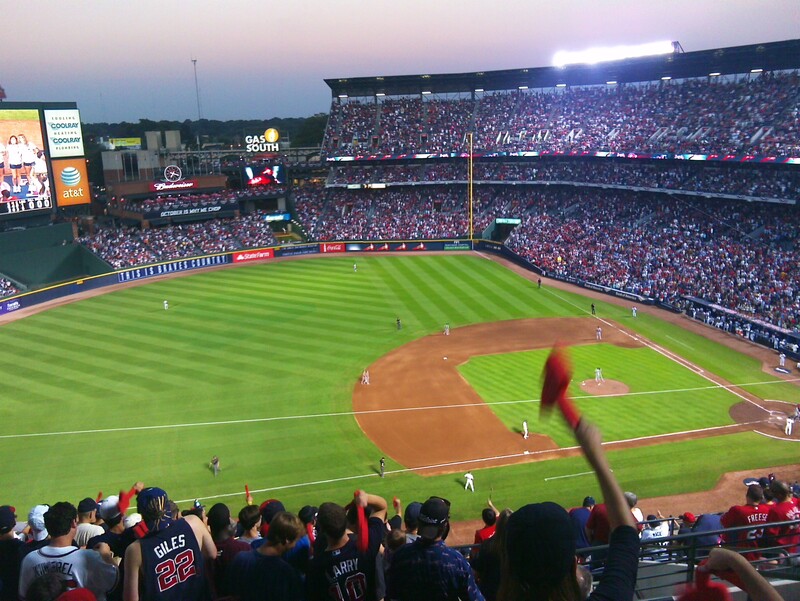 As I left Turner Field, the chants of “Chipper” rang out in the same cadence as another choice word had earlier in the night, when we had all lost our minds, and disgraced the National Pastime.